Jackson has been awarded a gold medal for outstanding hunting and bravery!! In the night I could hear him outside fairly close to the bedroom. He was talking to himself – little chirrups and mutterings. He always does this when he is in pursuit of prey. I assumed it was a mouse and went back to sleep. This morning we found a fully grown rat dead on the patio with Jackson’s trademark – blood sucked from the neck. John was very impressed and said he can have extra cheese tonight. These rats come into our garden from the surrounding fields – most probably looking for scraps that I throw out for the birds. Oh, and we found Jackson’s missing collar in the garden. I had already bought him a new one and so the old one can be for emergencies. No real news on the yarn front. I am expecting mire Calmer and Lima tomorrow and should be able to fulfil all outstanding orders. I shall also have some Garnet to spare which I will sell by the ball. The Pure Cashmere is nearly all gone at Rowan and so if anyone wants any, speak up! Now I must go and cook a duck leg for Slip’s dinner – back tomorrow. Here is the first question in the new contest. The prize is 3 Knit Pro circular needles in the winner’s choice of size and length subject to availability. The answers are all shade of yarn! 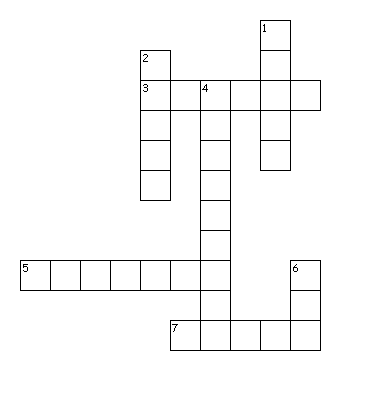 Answers to crossword @jannettesrareyarns.co.uk by midnight Wednesday. I received some nice shawl kits today. The contain Zitron Filigran Laceweight yarn, Knit Pro needles and the pattern. I will put them in my shop tomorrow..
Jackson came home this morning after a night on the tiles. His collar and bell were missing. He has slept all day but when he wakes up I shall tell him off. He must take more care of his collars! It is much colder here today but the forecast is for it to warm up tomorrow.I hope so, I dread those chilblains! Off to knit, back tomorrow. The contest! And we have a winner. The 3 shades of yarn which are also the names of types of curry are Tandoori, Madras and Vindaloo – all in the Rowan Siena range. The three yarns that can be woven are Rush, Reed and Raffia from the Summer Tweed range. Susan suggested Sailcloth, Hessian and Jute from the Cotton Jeans range. This answer could also be correct but I am afraid she could not find the curries! And so Jacki is the winner. Please let me know which shade of Manos del Uruguay Lace Weight you would like! I will start a new contest tomorrow. My knitting is back on track now! Kidsilk Haze is horrid to undo – but I managed it and now have the correct amount of stitches and the pattern is sitting correctly. I am cooking a chicken curry for lunch – a really hot one! And I have made an apple pie. John loves apple pie! My father used to have one every day of his life. Even if we went out for a meal, he would still choose apple pie and then complain that it was not as nice as the ones my Mother made! Oh, always custard too – never cream or ice cream! Now I must go and fry the poppadoms – always a messy procedure!! Back tomorrow. Hmm! I spoke too soon about the KSH not being difficult! Since taking this photo, I have knitted more and now see that I am out by one stitch for the last 5 rows! I am taking it back 5 rows but it is a very slow job sorting out what is what. I am not so enamoured with it now! I have been to the hairdresser this morning and done some grocery shopping. John is out shooting for the day. Jackson is playing with leaves outside. He will bring them in – there was a pile of walnut leaves beside the kitchen door this morning. 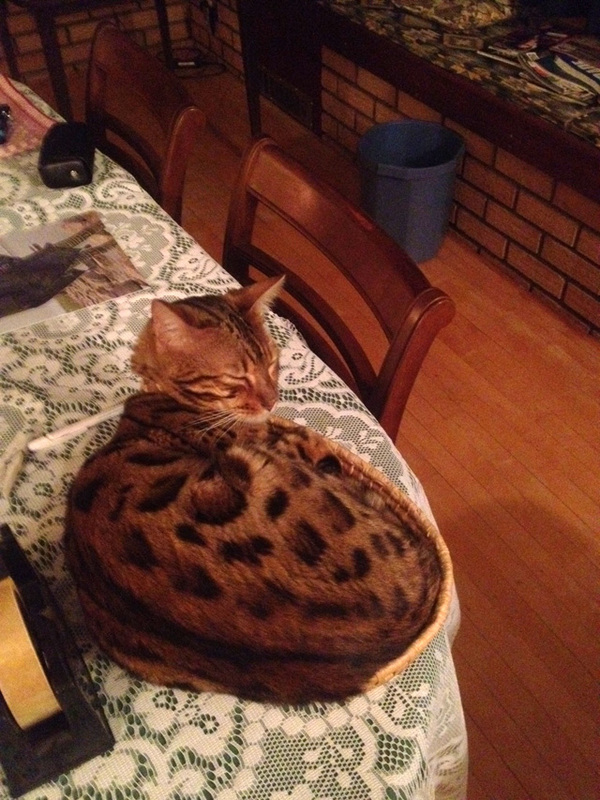 I had let him out at 6.0am and left the patio door slightly open so that he could come back in if he wanted to. He must have collected leaves and brought them in. No much other news today. I am going to struggle on unpicking Ash. It might be easier in daylight. Back tomorrow. I have now taken back Ash to where it was correct. I found a few funny loops but I think it will be OK as I have knitted another row and the pattern fitted. Fingers crossed! No, it is not right! I have now taken it off the needles and ripped it back to the eyelet row and shall start the pattern again! First, the contest. I did not make it clear enough! The answers to both parts are shades of yarn and they are from the same yarn within each question. By that I mean the first answer must be three shades of one yarn and likewise the second one. But the first and second answers are not from the same yarn range! Susan, your answer to the first question is incorrect, I am looking for the names of curries and Jackie, your answer to the second question is wrong! So will you both try again – answer by Saturday night! Sorry about this – as my husband often says, I seem to think people are mind readers. My curtains are all done – the men came this afternoon and fixed the rail and hung the last pair. Jackson is eyeing them up but I grumble at him and he looks away. 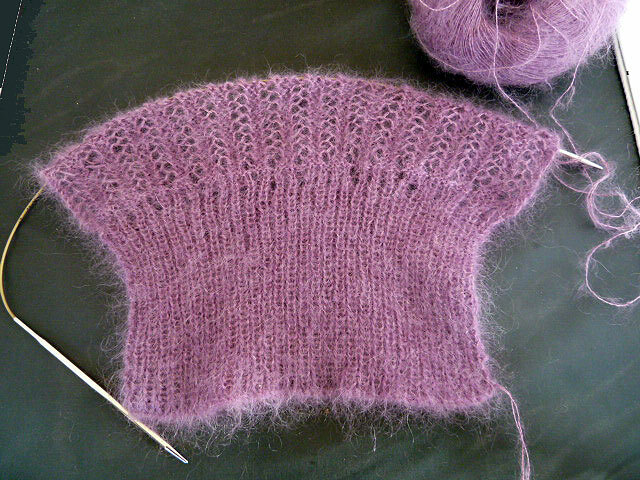 I had a slight hiccup with my Kidsilk Aura cardigan last night – I was one stitch short when I got to the end of a row. I managed to take it back and found a dropped stick. It was only one row down and so I retrieved it easily. Because I am knitting with it doubled, it is not too bad to take back. I will take a photo of it tomorrow. Now I must put the pork ribs in the oven and make the barbecue sauce! Never a dull moment. I am next for the photo shoot! Here is Jackson! He has managed to squeeze himself into the basket that I use to photograph balls of wool. I have a job to get 7 balls into it but he has managed to tuck himself in! I spent an exceedingly frustrating evening yesterday. Suddenly my laptop was unable to print over the wireless connection. I spent ages downloading new drivers and installing them. Still no go – laptop not found. There I was running back and forth, connecting it via USB and then wireless. I honestly spent 2 hours + fiddling about. I then gave up and decided to print from my iMac. Hmm! Printer not found when using iMac. More fiddling – nothing. Suddenly it dawned on me – the printer was not connecting to the network. I re-booted the router and everything worked! Lesson learned – re=boot router before trying anything else! We have been out for a meal tonight. I had confit of duck with cherry sauce, it was nice but the sauce was too sweet for me. John had steak and ale pie which he enjoyed. Now I am going to knit – I have nearly finished the rib on Ash. Eyelet row next! Back tomorrow. First, the contest! The answer is 5 and both Jackie and Susan solved this! Next one! 2 part question. Part one – where would I find three curries? Part two – where would I find three things that can be woven? Answers by midnight Wednesday to twoparts@jannettesrareyarns.co.uk. I ordered some more discontinued Calmer today. I have never knitted with Calmer – perhaps I should have a go before it is all gone. If only the day had more hours. Jackson has been doing a lot of mousing. He leaves the corpses in a heap beside the patio door and I have to dispose of them! I usually toss them over the fence into the next door garden – they will be good fertiliser for their lawn! I am pleased he does not eat them – no problem with worms that way. Now it is time to knit some Kidsilk Haze – back tomorrow.